What's Happening to SAP Hybris? What is SAP C/4HANA? What happened to SAP Hybris? What's the difference between SAP C/4HANA and SAP S/4HANA? What do the recent acquisitions mean for the customer? What's next for the future of C/4HANA? You may have heard the buzz at SAPPHIRE 2018 around the rebranding of SAP Hybris to C/4HANA and had a lot of questions. Join us to learn what SAP's recent announcement means for you. 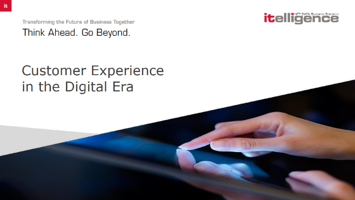 Hear firsthand from industry expert Bob Meyer, VP Customer Experience at itelligence, how these recent changes will affect customers and change the product roadmap.